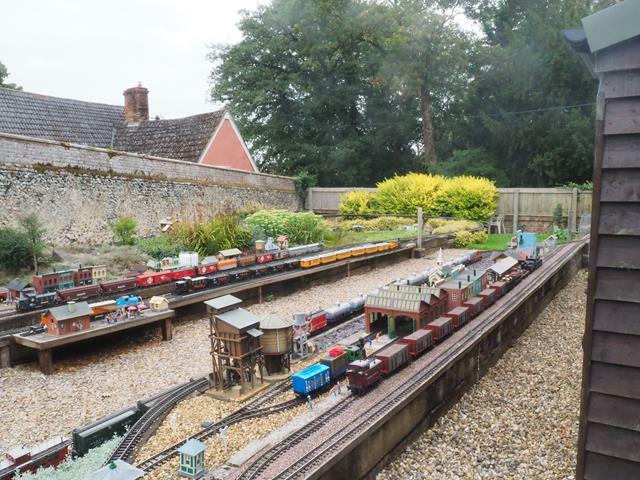 After some years enjoying watching other peoples' pictures of them building their railways, I thought I would share some of mine now that I have finally (hopefully) managed to work out how to batch downsize the images. 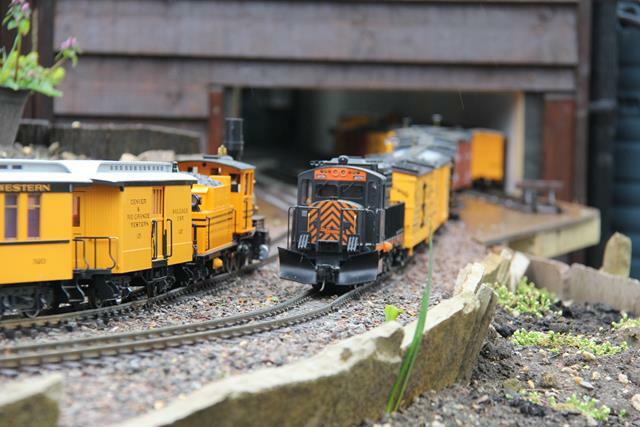 The AGC (Atchison, Girdlestone and Creed) Railroad started life when we moved in 2010. 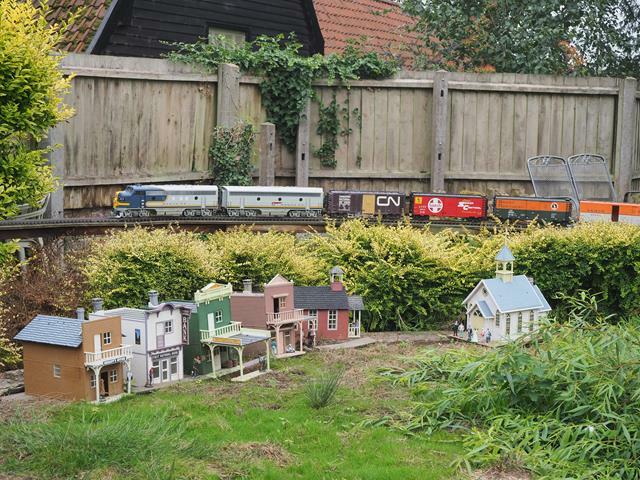 There were two previous (smaller) railroads before that so I had some idea of what I was setting out to achieve. I will try and tell the story as we go along. 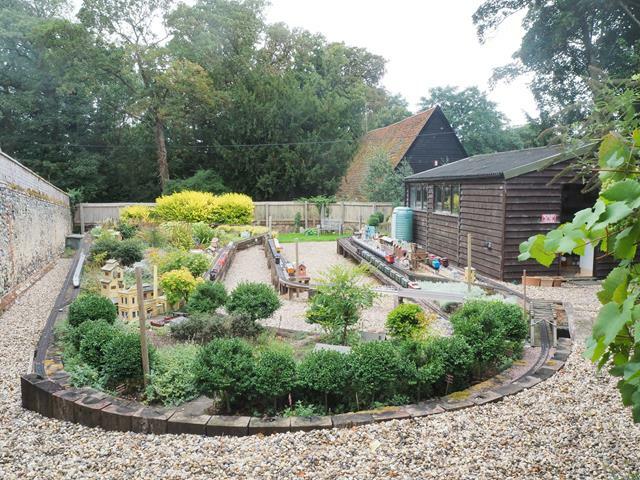 We are fortunate to have a large (>1 acre) garden, and part of the deal for moving (like most men I was a little reluctant to be uprooted)_ was that a section of it, fortunately nicely hidden away from most of the rest of the garden was mine for trains. The first thing was to clear the area, and then put up a shed to get all the boxes out of the roof! If I can make this post work I will continue with the story! for those who have struggled with image resizing "fotosizer" available free seems to work well for me and allows batch resizing. 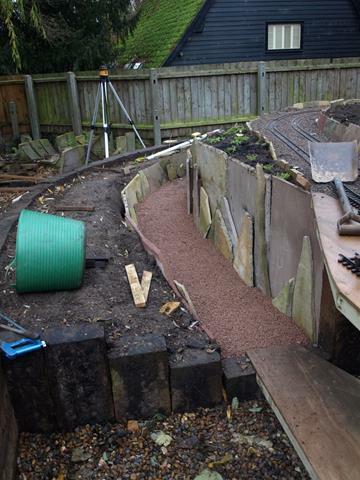 Although it is not obvious there is quite a slope, with about a 40 inch fall from top to bottom so some landscaping was going to be needed. In addition I wanted the ability to run several trains independently by my self on separate circuits and have one big circuit on which multiple operators could run several trains at the same time using DCC. All my engines are chipped and most have sound. in case you did not guess from the name AGC I run US outline almost exclusively. Max gradient on the main line was to be 2% and minimum radius for all but point work was 10 ft. 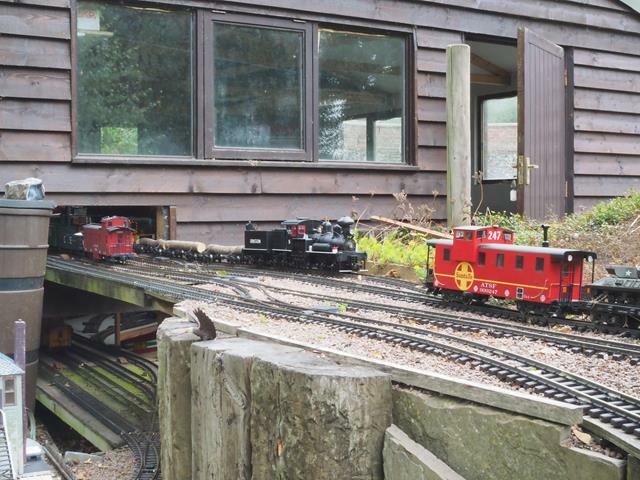 There would be two main levels the upper and lower, with the latter being on the main circuit and the former being to start with a pair of lines running though the shed. 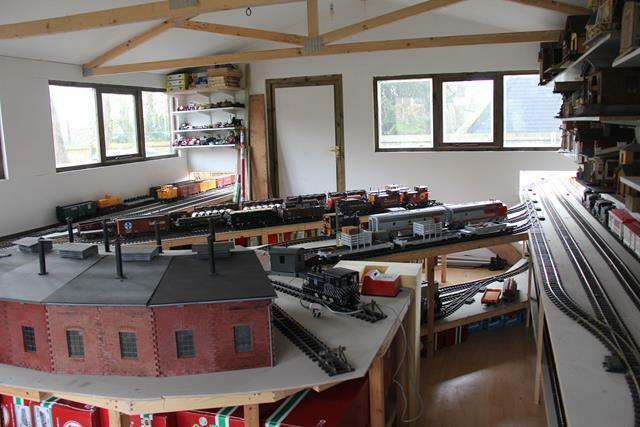 I started by building an elevated upper section behind the shed to allow me to get something up and running. 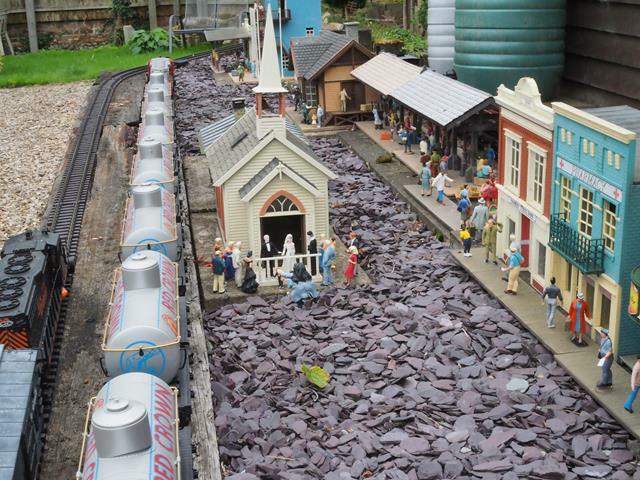 Trains run out of hatches in the shed at each end. There a re a total of 6 hatches. 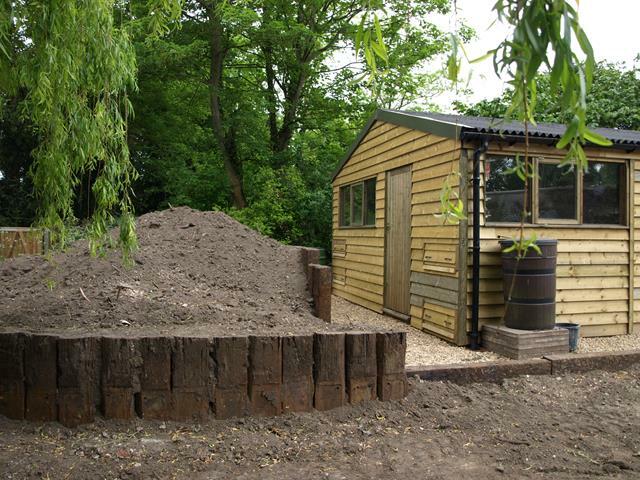 Definite shed envy here, as well! 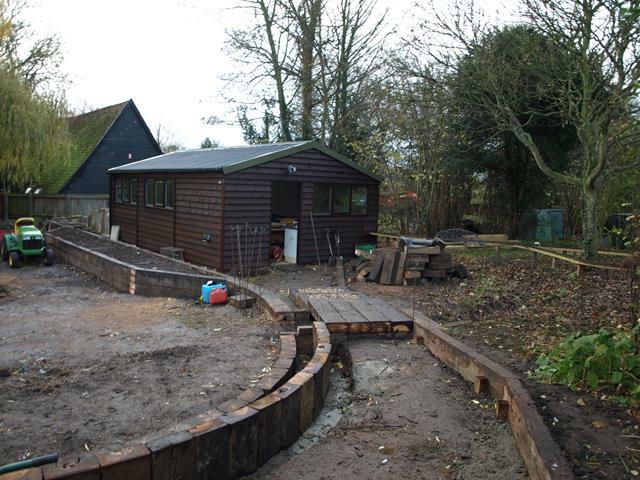 I like the Shed as well, not sure that I could have fitted one that size in my plot. But perhaps I could have. If I had wanted I could have got one 20ft x 16ft. 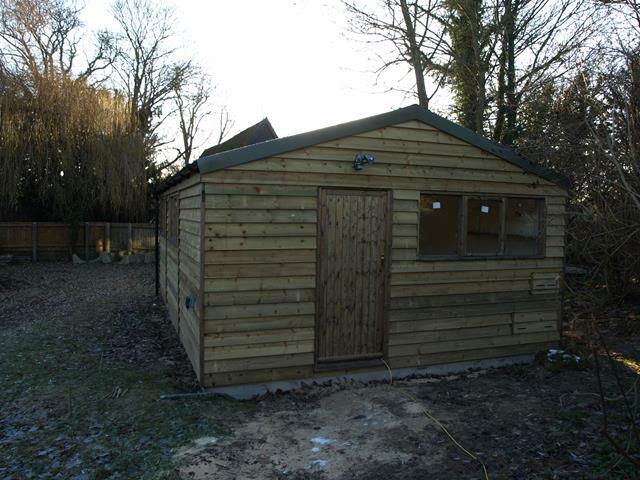 What size is your Shed? Shed? What shed? That construction is as big as my house! 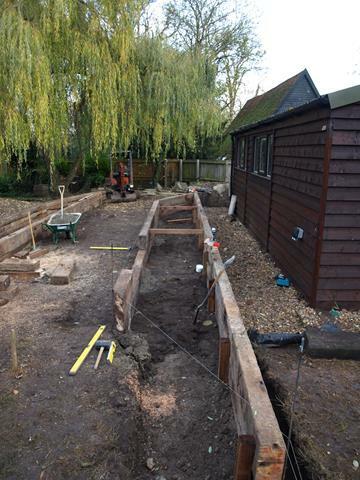 Work then started on the elevated section at the back of the shed. 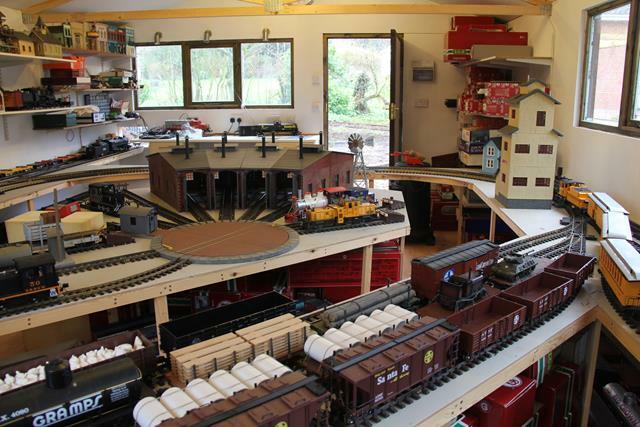 This was going to have trains at three levels, the top level as part of a small circuit running in and out of the shed (and though to the front reverse loop) with a long term plan of an extension into a wooded area at the back, and at a lower level the main line running round the edge of the elevated section with a branch into the shed low level sidings, and finally another set of sidings starting at the front of the shed running in a deep cutting to join the main line round the back with a steady gradient upwards. 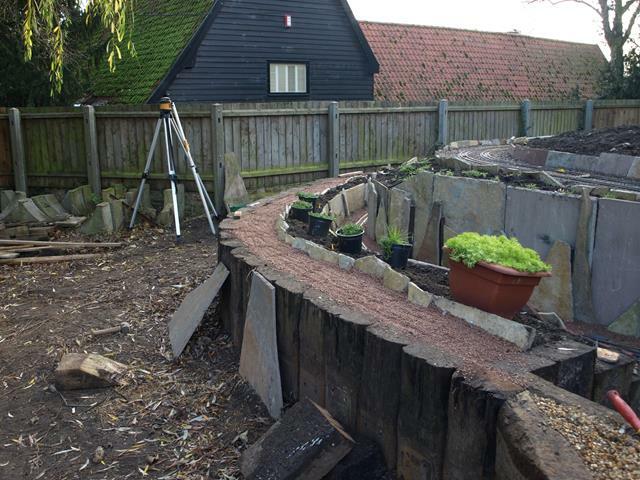 Holding back the retaining wall for the deep cutting was a problem solved by finding a local garden center which sold real stone paving. 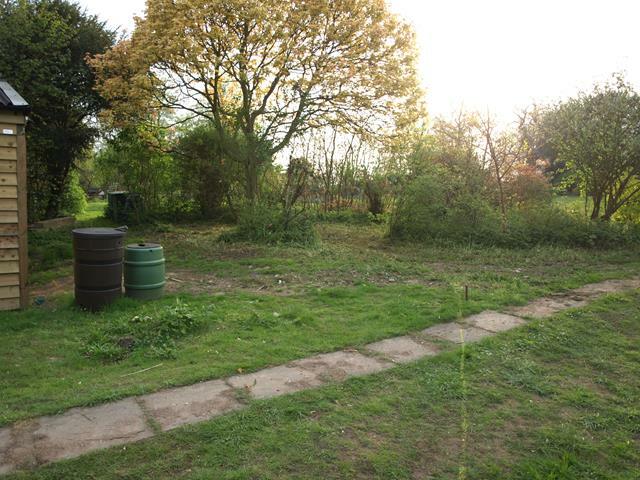 They had a couple of pallets of broken slabs, some of the big ones, and were happy to sell both for about £100 delivered (bearing in mind this is a few years ago it was still a good deal). 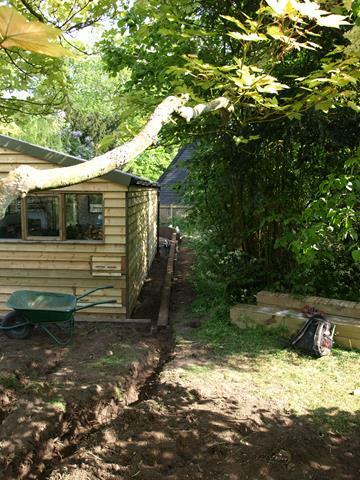 Track emerging from the back end of the shed front at two levels. The upper level is just a circuit, the lower you can see as a cutting with stone retaining walls. 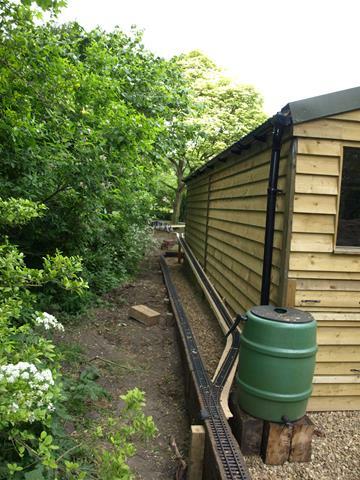 this illustrates the tow levels as they emerge from the shed. 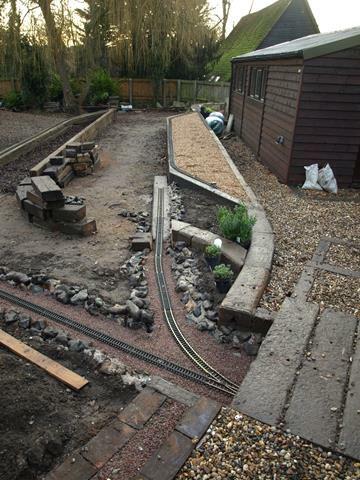 Both have now been graded with "grano" which is granite chippings and makes great track bed ballast. 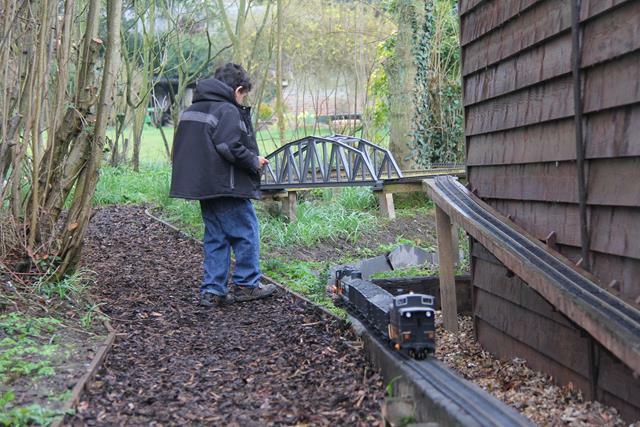 Track was laid on the upper level so I could run a few trains. The green bucket is sitting were the main line is going to run. 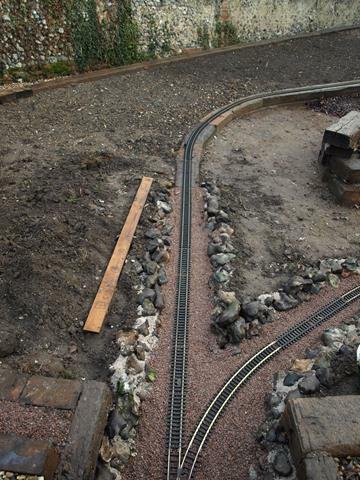 Track now laid in the cutting and the main line has been graded. Note the rotating laser in the background. One of the best investments I have made for getting the gradients right when doing things on this scale. 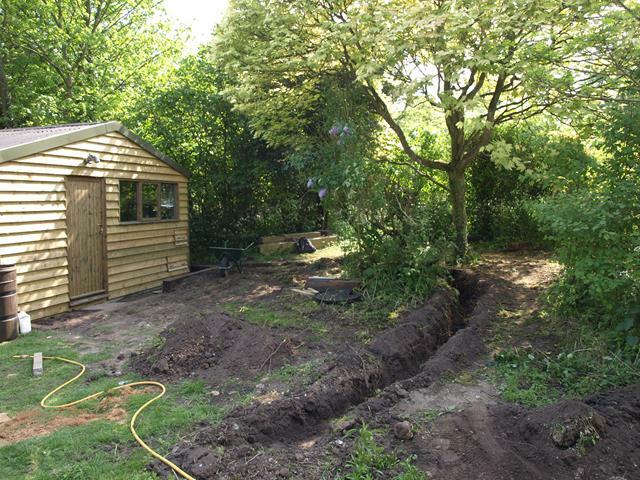 No more hoses and water or spirit levels. No picture of the arrangement on the far side of the elevated section I am afraid. I will take one in a few days. 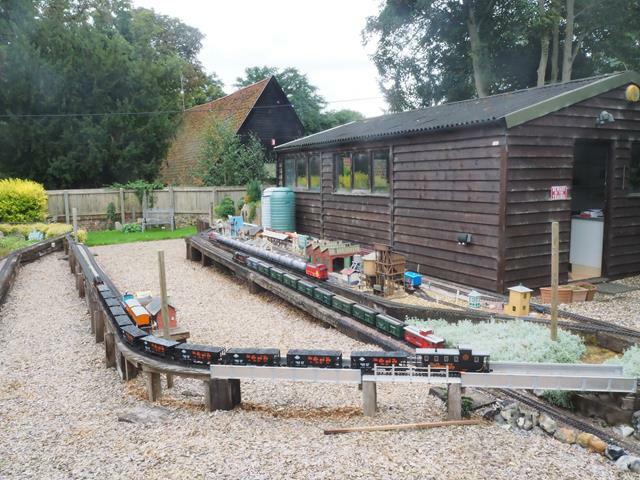 We could now run a few trains albeit on a pair of small circuits on the upper level running in and out of the shed though the rear upper hatches and on round to the reverse loop at the front. This was just the beginning. 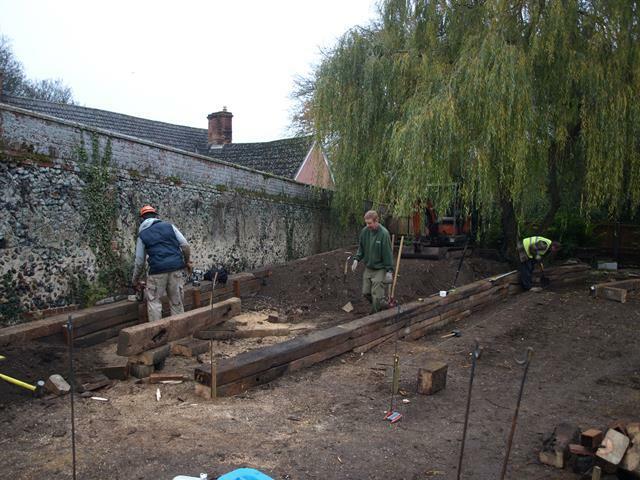 In order to deal with the changes in elevation cause by the sloping ground some serious retaining walls had to be built. 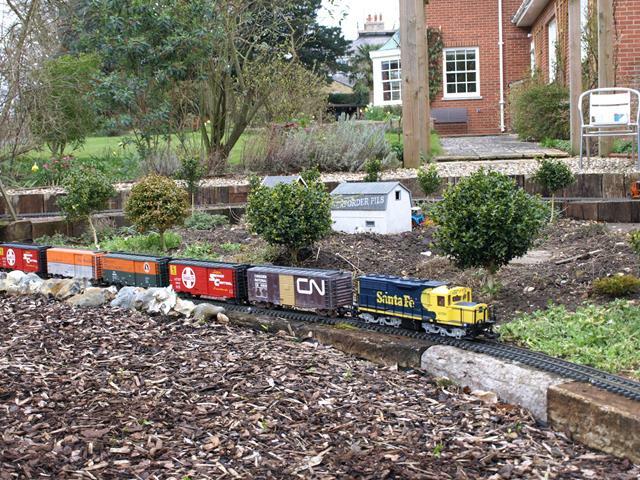 Once again I elected to use old railway sleepers, there is certain charm about running ones garden railway on them.....until you discover that some of them ooze tar in hot weather which while visiting big and small boys are indifferent their wives and mothers are less keen if gets on their clothes. 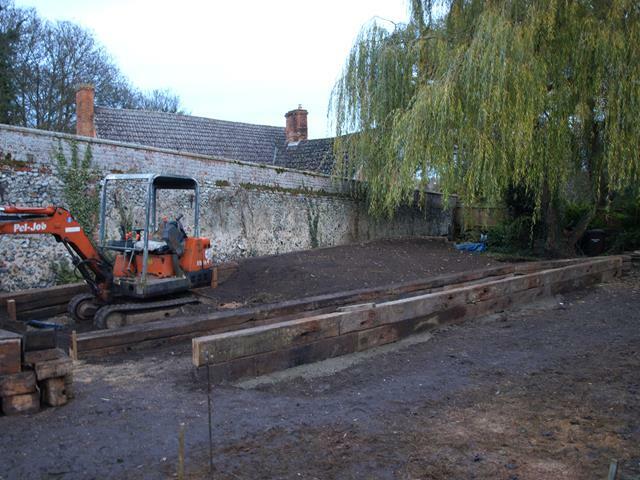 Sleepers are very heavy as I discovered trying to move them from the front to the back by myself (with a garden tractor and trailer). One shoulder injury later I was sure that this would need some help. This was the one bit of the project I could not do by myself. 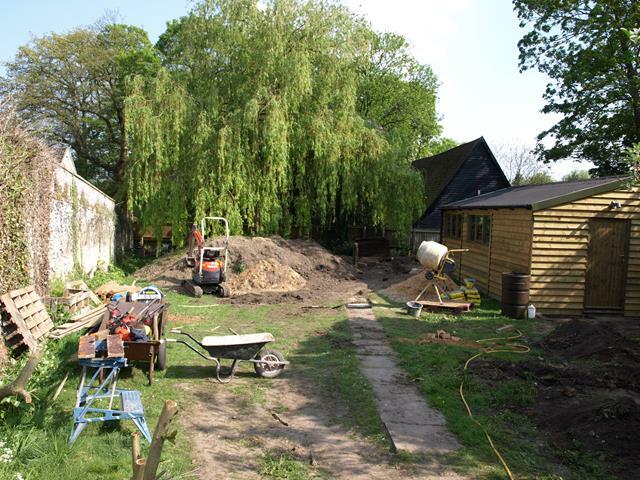 A local firm who had done some other work were bit bemused but friendly and helpful. 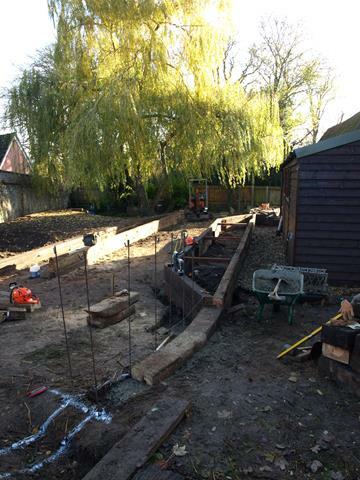 They were used to making all their retaining walls level, and found setting some to a 1:50 gradient was something of al challenge! 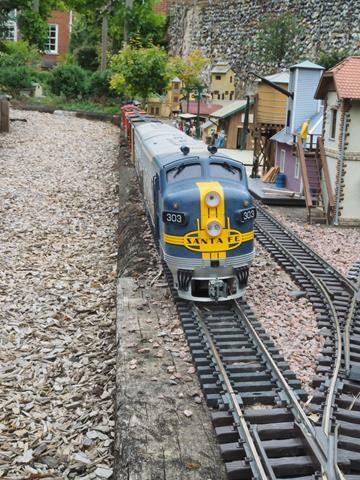 Trains were going to run down on the left right hand side round the tree and back on the left. you can see how the ground falls away as you move away from the foreground. Far too much soil shifting need to do it by hand so a mini digger hired for a couple of weeks. As will become apparent the sleepers in the foreground are to allow the large figure of 8 main line to be converted into two separate circuits to make it possible to run more than one train if I was on my own. 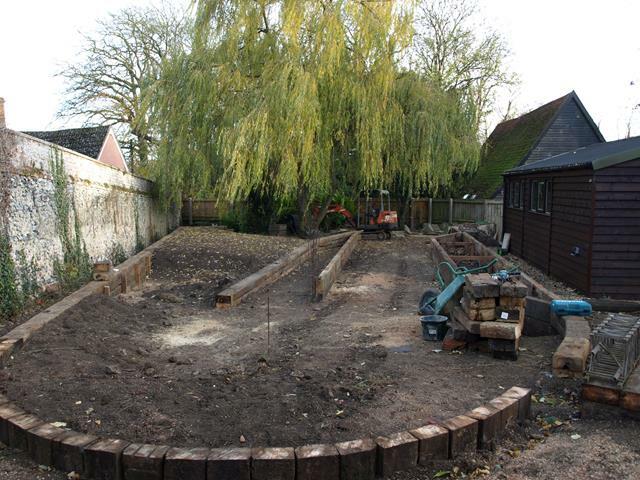 this raised bed was being made next to the shed to hold a townscape. At the far end it ran into the raised area behind the shed illustrated in the previous post. 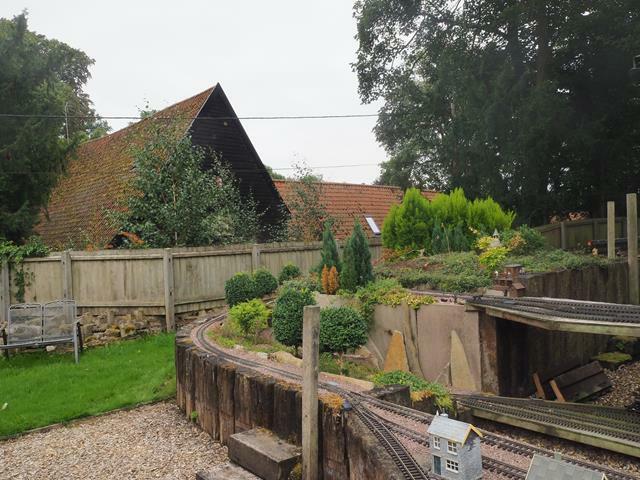 The main line would run along the top of the sleepers nearest the shed. This makes things a bit clearer. 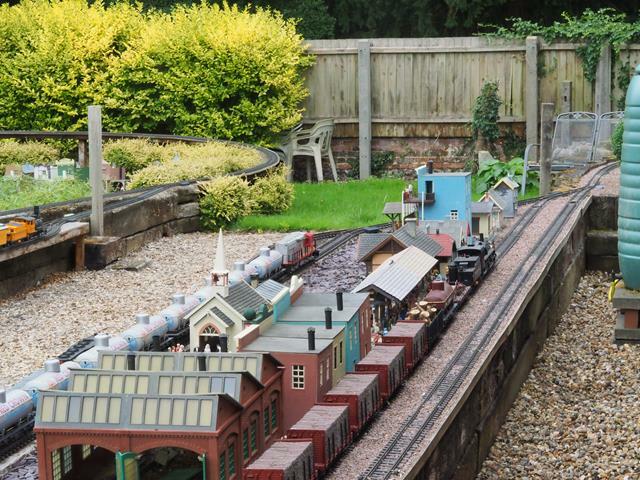 The main line comes up the elevated section parallel to the wall, round the on end sleepers in the foreground crosses the bridge(which you can see out of position) where the gap is and down the side of the shed to link up with the elevated section previously shown at the back of the shed. as well as a railroad bridge, a foot bridge was also needed for crossing the lower section of the mainline. 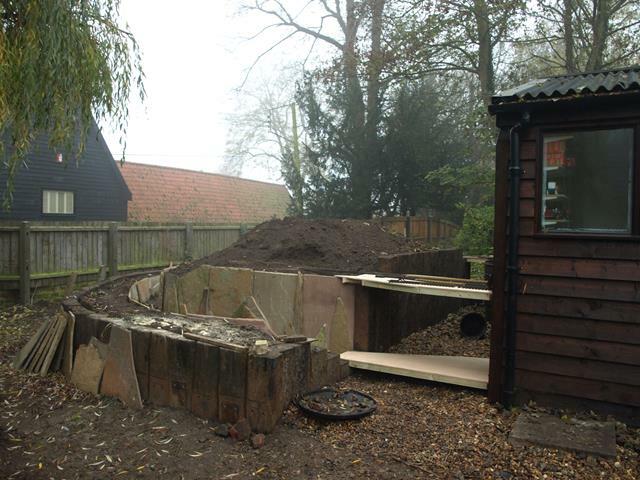 This ran up the back of the shed on sleepers and then into a cutting which you can just make out to the right of the footbridge. 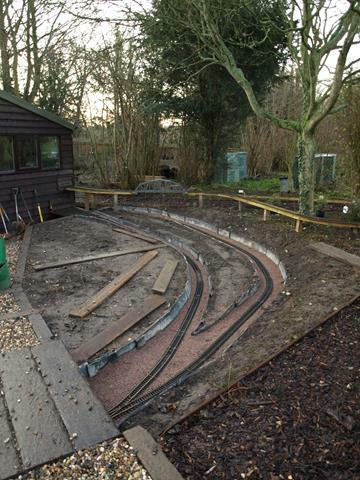 the sleepers in the foreground on the right are simply to retain the gravel footpath and will not be carrying track. 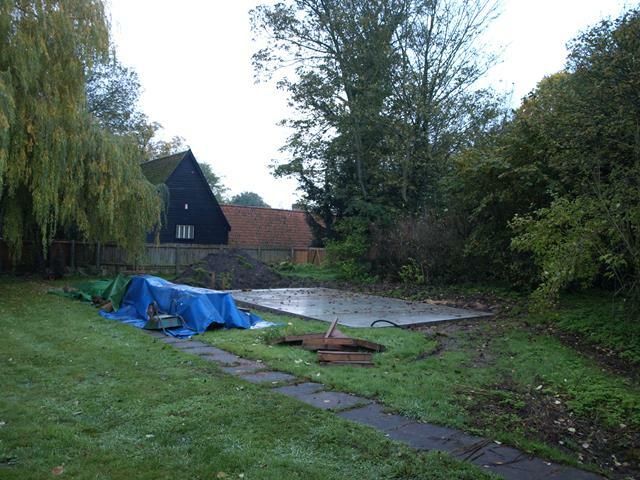 And suddenly 'the big shed' does not look so big.. 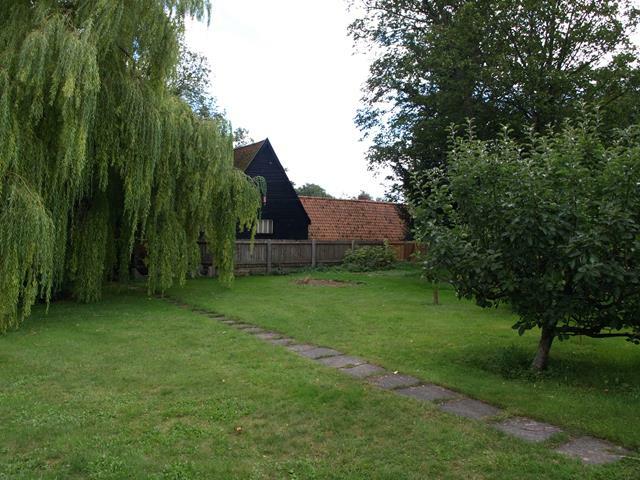 Presumably, your house is behind you in the last photo above? 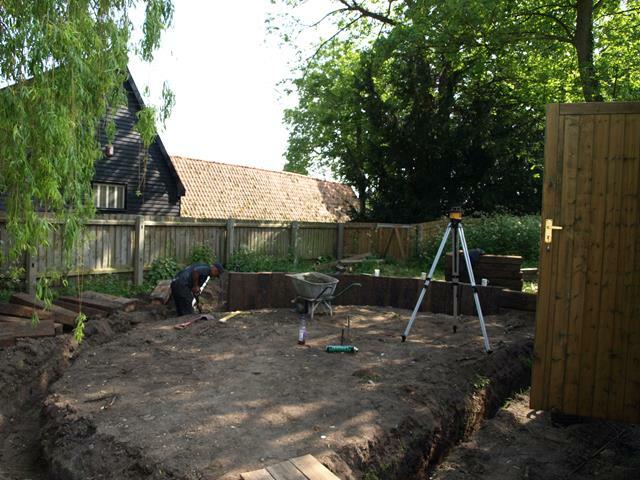 At ground level the method I developed was to line the sides with bits of broken stone paving (fortunately I had lots) as you can see here, then put a weed proof membrane in the trench and fill it with ballast. This needs an annual cleanup and top up, and occasional application of weedkiller but is low maintenance. It also allows for fine adjustments to the gradient. This section here is where the line from the front of the shed (on the left) joins the mainline that has been running up behind the shed. is is sloping down towards the camera and the footbridge at 1:50. Lots of jiggling to make the geometry fit here, and a set of points almost under the bridge which is not ideal. 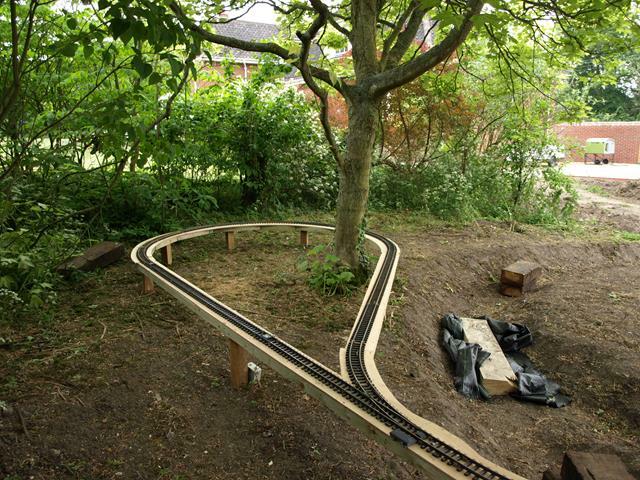 similar view different angle, main line curves down to run towards and then round the willow tree and the bottom end before returning on the far sleeper retaining wall (track not yet laid). 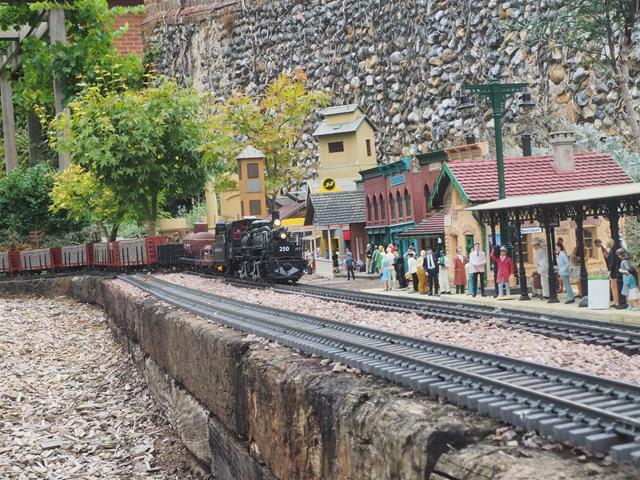 Track is mostly LGB but there are some sections of Aristocraft. All points are LGB R3 as I found the aristo ones did not stand up as well, and died. 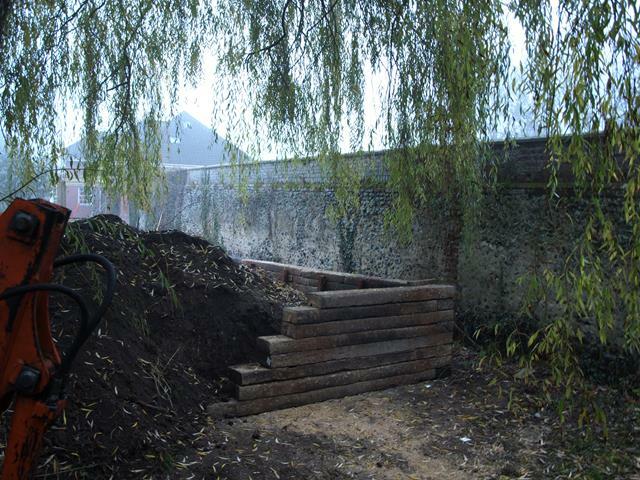 the curved area round the willow tree (not illustrated yet) used my other method of laying track which is ply on a 2"x1" treated timer frame work help up by fencing posts. I do not fix the track down anywhere, preferring to leave it floating.. This means that it does move a bit but I never have any trouble with rail expansion nd taking it up is very quick and easy. How much snow do you get? Do you plan to run in the snow ? The lower level town (Creed). 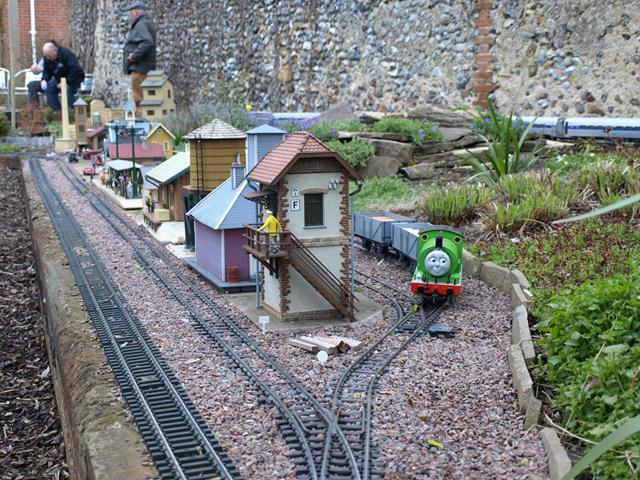 Percy is concession to smaller visitors, Thomas is around somewhere too, pity they don't run better. which over sever years makes a great tree. 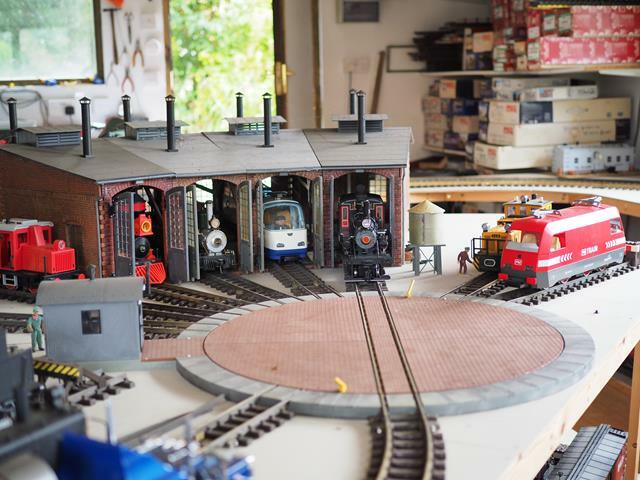 While in the shed the roundhouse is full. 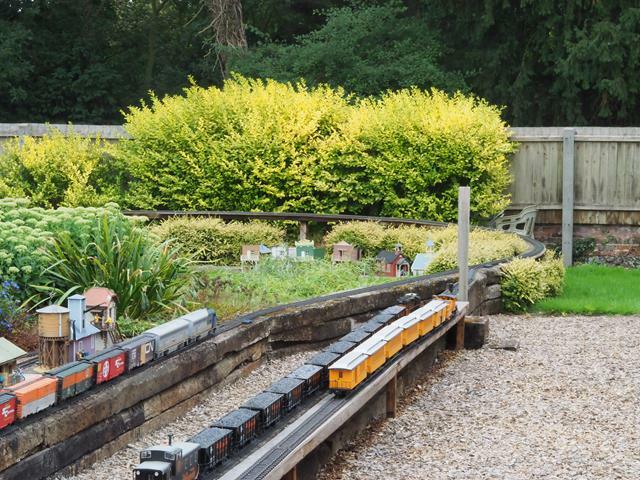 I keep a few playmobile engines and rolling stock for younger visitors and now my granddaughter. They are virtually indestructible, unlike LGB. 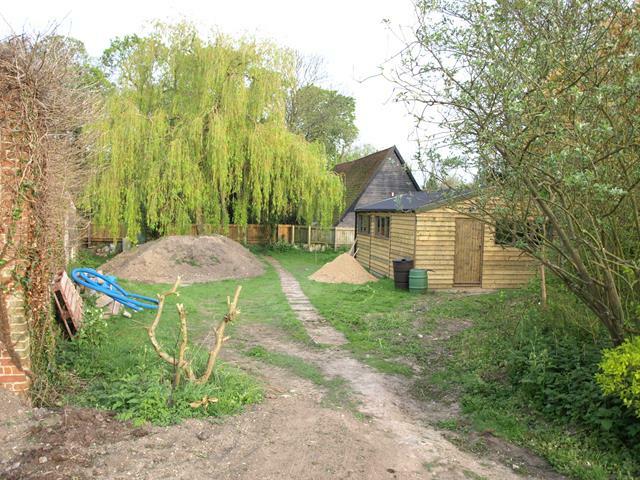 About 5 years ago I decided a planned expansion into a wooded area went ahead. 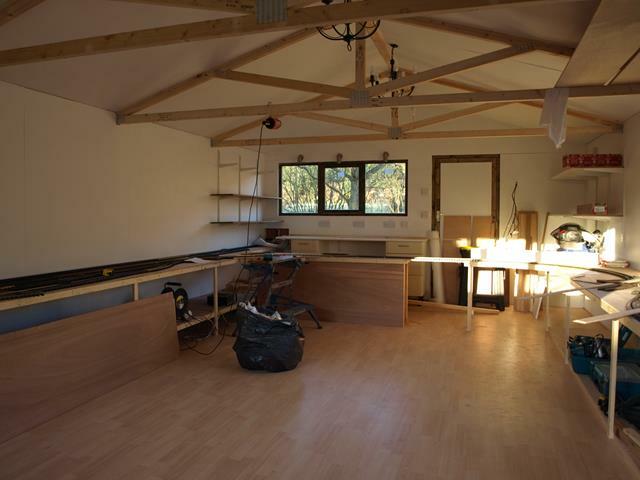 This is on the upper level and is built with ply and posts. 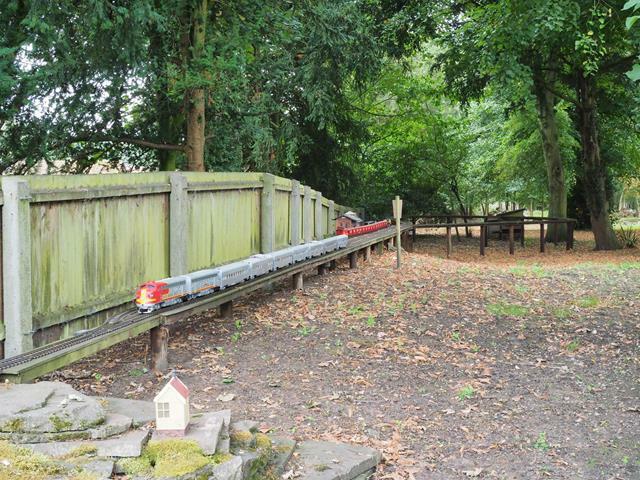 It comes out of the back of the shed and as you can see runs down to a very big reverse loop before returning. 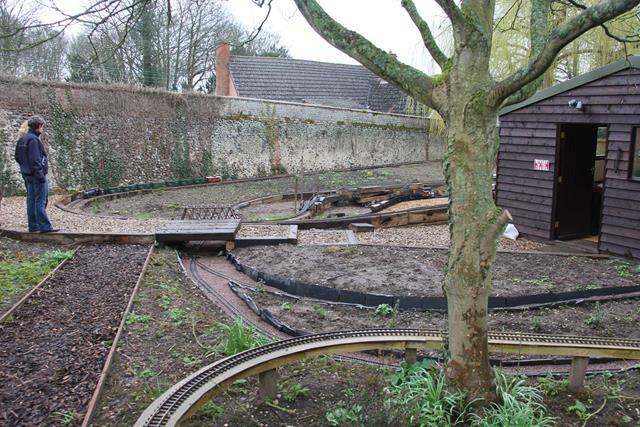 There is section of single track just visible on the left which runs though the shed before emerging onto the reverse loop section at the front of the shed illustrated in much earlier posts. 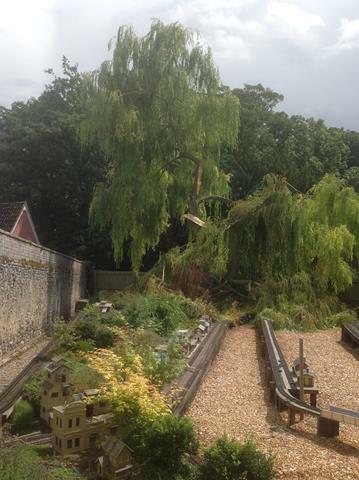 sad as it was a lovely tree but it did leave a lot of leaves on the line. That is one heck of a lot of work already put in, it'll be fabulous when it's finished (or more complete, these things are never finished). I'd be happy just to have the 22x16 shed! I don't run in the snow or much in winter. I do have a USA trains rotary snowplough but its not much good in real snow. Have thought about a blade plough but I am all DCC and clean track is needed. I suspect successful winter snow ploughing needs battery driven engines. That looks great I bet you have a great time testing that little lot! Great. I like a good solid build. That's a fantastic (in scale terms) piece of civil engineering! Wonderful indeed.